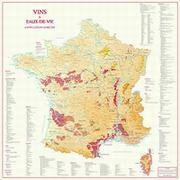 France Wine Maps from Omnimap, a world leading map store with 250,000 map titles. Postcards of Wine Regions of France. France Wine Region Map Posters. Wine Maps of France. Maps that cover all of France. Wine Maps of the Beaujolais Region. 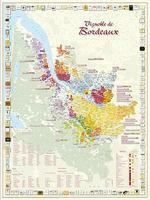 Wine Maps of the Bordeaux/Bordelais Region. Wine Maps of the Burgundy Region. Wine Maps of the Champagne Region. Wine Maps of the Languedoc Region. Wine Maps of the other Regions - Provence, Côtes du Rhone, etc. Wine Region Postcards! Editions Benoit. Attractive postcards of the famous wine regions of France. Printed on coated postcard stock, these make great little add-ons to go with a gift bottle of wine, or as a memento of a favorite locale. These cards measure 105 x 148 mm. In French. $3.99 64-5680-FRA France wine region postcard. $3.99 64-5680-ALS Alsace wine region postcard. $3.99 64-5680-ANJ Anjou wine region postcard. $3.99 64-5680-BEA Beaujolais wine region postcard. $3.99 64-5680-BER Bergerac wine region postcard. $3.99 64-5680-BOU Bourgogne (Burgundy) wine region postcard. $3.99 64-5680-CAH Cahors wine region postcard. $3.99 64-5680-CDR Côtes-du-Rhône wine region postcard. $3.99 64-5680-CEN Centre-Loire wine region postcard. $3.99 64-5680-CHAB Chablis wine region postcard. $3.99 64-5680CHAM Champagne wine region postcard. $3.99 64-5680-COR Corse wine region postcard. $3.99 64-5680-GRA Graves wine region postcard. $3.99 64-5680-JUR Jura wine region postcard. $3.99 64-5680-MED Médoc wine region postcard. $3.99 64-5680-PRO Provence wine region postcard. $3.99 64-5680-SAN Sancerre wine region postcard. $3.99 64-5680-SAU Sauternes wine region postcard. $3.99 64-5680-STE Ste Emilion wine region postcard. $3.99 64-5680-SUD Sud Ouest wine region postcard. $3.99 64-5680-TOU Touraine wine region postcard. French wine region posters from Editions Benoit. Editions Benoit. This series of wine posters from the well-known French cartographer Editions Benoit offers a new handy size/format for wine maps. 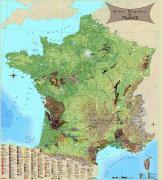 Wine posters of 55 wine regions in France are planned; to date 44 wine posters are available. These posters, 11.75 x 15.75 inches (30 x 40 cm), offer excellent detail of each wine region, including contour lines, roads, villages with names, etc. "Premiers Crus" and "Grands Crus" are represented in specific colors where appropriate. $19.99 64-5681-ALO Aloxe-Corton wine poster. $19.99 64-5681-BEAU Beaujolais wine poster. $19.99 64-5681-BEA Beaune wine poster. $19.99 64-5681-BOUR Bourgueil et St-Nicolas de B. wine poster. $19.99 64-5681-CHA Chabls et Grands Crus wine poster. $19.99 64-5681-CHAM Chambolle-Musigny wine poster. $19.99 64-5681-CHAS Chassagne-Montrachet wine poster. $19.99 64-5681-CHIN Chinon wine poster. $19.99 64-5681-CON Condrieu wine poster. $19.99 64-5681-COR Corsica (Corse) wine poster. $19.99 64-5681-COBE Cote de Beaune wine poster. $19.99 64-5681-CONU Cote de Nuits wine poster. $19.99 64-5681-CORN Cote du Rhone North wine poster. $19.99 64-5681-CORS Cote du Rhone South wine poster. $19.99 64-5681-CORO Cote-Rotie wine poster. $19.99 64-5681-CROZ Crozes-Hermitage wine poster. $19.99 64-5681-GEV Gevrey-Chambertin wine poster. $19.99 64-5681-LANG Languedoc-Roussillon wine poster. $19.99 64-5681-MAR Margaux wine poster. $19.99 64-5681-MED Medoc wine poster. $19.99 64-5681-MEUR Meursault wine poster. $19.99 64-5681-MOU Moulis et Listrac wine poster. $19.99 64-5681-NUI Nuits-Saint-Georges wine poster. $19.99 64-5681-PAU Pauillac wine poster. $19.99 64-5681-PES Pessac-Leognan wine poster. $19.99 64-5681-POM Pomerol wine poster. $19.99 64-5681-POMM Pommard wine poster. $19.99 64-5681-PROV Provence wine poster. $19.99 64-5681-PUL Puligny-Montrachet wine poster. $19.99 64-5681-STEM Saint-Emilion wine poster. $19.99 64-5681-STES Saint-Estephe wine poster. $19.99 64-5681-STJU Saint-Julien wine poster. $19.99 64-5681-SAU Sauternes & Barsac wine poster. $19.99 64-5681-TOUR Touraine wine poster. $19.99 64-5681-VOL Volnay wine poster. $19.99 64-5681-VOS Vosne-Romanée wine poster. $19.99 64-5681-VOU Vougeot wine poster. France Wine Map. Vinmaps. Features over 300 wine regions. Unique, highly detailed map of the premier wine regions of France. We have created a one of a kind glimpse of the French terroir. Size is 32 x 36." $78.99 64-56802 1 sheet, flat. $99.99 64-56802L 1 sheet, laminated. France Wine Map. DeLong, May 2011. Includes detail maps of Bordeaux, Côte d'Or and Beaujolais as well as ajacent wine regions in Germany, Italy and Spain. Also includes detail maps of Bordeaux, Côte d'Or and Beaujolais. Size is 24 x 36". Also available framed in an elegant black wood frame with acrylic cover sheet (25 x 37" framed). $29.95 64-56803 1 sheet, flat. Metro Wine Map of France. DeLong, September 2011. The most amazing thing about this novel new wine map is how clearly it shows France's complex wine regions. This delightful map shows how to access the wine regions of France using the French rail system. Created by architectural historian and wine buff Dr. David Gissen, it's fun, great looking and wonderfully informative. The major wine regions of France and their appellations shown clearly in their relative positions. Major grape varieties shown in context with their corresponding appellations. Major geographical features and architectural landmarks indicated. Size is 18 x 24". Also available framed in an elegant black wood frame with acrylic cover sheet (19.5 x 25.5" framed). $24.95 64-56804 1 sheet, flat. France Wine Maps. Editions Benoit, cartographer and publisher of a fine line of wine maps of French wine regions, is redesigning all of his maps. Five are now available in the new format: Europe, France, Bordeaux, Burgundy - le Grande Côte, and Alsace. The others will be published later in 2008 and 2009. The maps listed here are all in stock at this time. Some titles are in limited supply, such as Maconnais, Mersault, Armagnac, Pommard, etc. These are great maps that make wonderful wall decorations as well as being extremely detailed maps of the world-famous French wine regions. Most titles are available either flat or folded. Each map covers a specific region, with information on the varieties and the vineyards in the margins. The base maps are typically shaded relief maps showing the roads, villages, and often the buildings. Wonderful gifts for the wine connoisseurs. In French. The Wines & Spirits of France (Vins & Eau de Vie d'Appellation d'Origine de France) - large size. 1:1,400,000. Editions Benoit. French appellation wines and spirits including still and sparkling wines, Vins Doux Naturels (VDN) and Vins de Liquers. Size is 34½ x 34½". In French. Image of the entire map. Principaux Cépages des Vignobles de France (Principal Grape Varieties of France). 1:2,000,000. A compendium of grape varieties, region by region and appellation by appellation, with their main characteristics and the types of wines produced. Size is 26 x 30 inches. In French. Beaujolais Wine Map. IGN. Detailed road map showing the vineyards of the Beaujolais area, with places of interest and recreational facilities. Map legend includes English, text in French only, size is 29 x 35". $14.95 64-56812 1 sheet, folded. 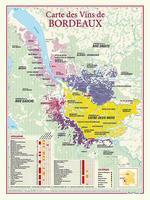 Bordeaux Wine Regions Map. Vinmaps. Features general AC boundaries and major communes. Size is 24 x 35". $55.99 64-568241 1 sheet, rolled. The Vineyards of Bordeaux. 1:250,000. Editions Benoit. The appellations of the region with the châteaux that have been officially classified. In French. Size is 26 x 33" (66 x 83 cm). Image of the entire Bordeaux map. Sample of 4" x 4" part of the map. Sample of 8" x 8.5" part of the map. Enlargement of 4" x 4" part of the map. Burgundy Wine Regions Map. Vinmaps. Features general AC boundaries and major communes. Size is 24 x 35". $64.99 64-56813 1 sheet, rolled. The Vineyards of Burgundy (Bourgogne). 1:240,000. Editions Benoit. Attractive shaded relief map showing the vineyards of the region. In French. Size is 66 x 88 cm. The Grande Côte. 1:40,000. 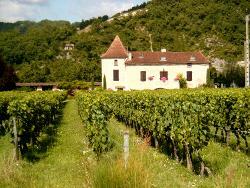 Covers this prestigious region of Burgundy and lists the grand crus and premier crus. Size is 132 x 50 cm. In French. Wines of The Mâconnais (Vignoble du Mâconnais). 1:70,000. An attractive map covering the region of Saint-Véran, Pouilly-Fuissé, Pouilly-Loché, and Pouilly-Vinzelles. The map shows the ancient and current vineyards, the geology, etc. In French. Size is 66 x 88 cm. $14.95 64-568299 Folded. With English summary. Champagne Wine Map. Vinmaps. Discover anew the alluring and magical terroir of Champagne - where the bubbly of the same name originates. 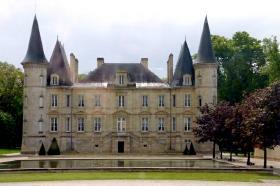 Major champagne houses are noted in addition to various fascinating, historical, geographic, facts. Size is 36 x 20 inches. $59.99 64-568292CH 1 sheet, flat. Champagne Wine Map. France IGN. Folded map of the Champagne wine region of France. In French. $12.95 64-568292 1 sheet, folded. 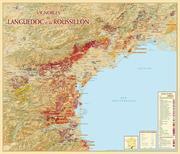 Languedoc & Roussillon Wine Map. Editions Benoit. In French, size is 26 x 30". Image of the entire Languedoc wine map. Wines of coteaux de Languedoc. In French. Wines of côtes de la Malapère. In French. Wines of Faugères. In French. Wines of Limoux. In French. Wines of Minervois. In French. Wines of St. Chinian. In French. Wines of the Alsace (Vignoble d'Alsace). 1:120,000. Includes the different appellations, Grands Crus, grape varieties and types of wine with their different characteristics, the wine route and tourist sites. In French. Size is 55 x 88 cm. Wines of the Armagnac (Eaux-de-Vie d'Armagnac). 1:200,000. The map shows the three regions of the Armagnac, plus a history of the vineyards, the soils, the geology, and the characteristics of the wine. Also information on the alembic or pot still and how it works. In French. Size is 66 x 66 cm. Wines of Chablis. In French. Wines of côtes du Rhone. In French. Size is 28½ x 38½". $47.99 64-568215L Laminated. NOTE: Laminated version uses the folded map so the creases will show. Provence Wine Map. Editions Benoit, France. This map shows the areas demarcated AOC Provence: Côtes-de-Provence with its extensions of Fréjus, the Sainte-Victoire mountain and Londe, the Coteaux d'Aix-en-Provence, Bandol, Palette, Cassis, Bellet, Coteaux de Pierrevert and the vineyards of Luberon. The embossed background highlights the different viticultural areas of this vast region. In French. $14.95 64-568214 1 sheet, folded. $24.95 64-568214P 1 sheet, flat/rolled. Wines of Touraine. In French. France IGN. $39.95 64-56828L Laminated. NOTE: The laminated version uses the folded map, so the creases will show.